Finding your niche(s)Â is key to successful online advertising. All 4 are valid.Â 3 and 4 are good for internet marketers who may want to try a number of niches and see which ones are most profitable. The process involves building niche websites and monetizing them. Generally I advise people to select a niche using some combination of 1 and 2. If you have a strong interest in a subject you are far more likely to delve deeper into it, youâ€™ll find more interesting things to talk about, and youâ€™ll keep at it longer. And if your niche isÂ somehow related to the work you do, you have a headstart in building an â€œauthority brand.â€ Having an authority brand is like the engine that will propel you alongÂ roadmap to Internet success. It enables you to earn credibility and trust and a loyal following. Passion is like the sparkplug. If you have passion for a subject, all your content building and marketing runs smoother and better. Sometimes when you delve into a subject, the passion may find you.Â And when it finds you, you know it. If you want to try try to entering a number of niches and build niche sites and then monetize themâ€¦there is a new ebook which is among the best Iâ€™ve seen on the subject. Itâ€™s by a young guy who I first came across a few years ago withÂ his book on monetizing blogs. It was packed with extremely useful and very unique techniques. It’s ironic that one of the most effective ways today to market products and services online is through offline marketing. This can be especially effective when used in an offline to online to offline strategy. What I mean by that is that your mailer or ad includes your url and your telephone number. The url gives the reader the opportunity to learn more about your product or service before you talk to them. Some may call you. For those who do not, you can follow up with a phone call. People are much more receptive to these kinds of follow up calls rather than cold calls. In a recent campaign I did, I followed up with one prospect and asked him if he had seen my mailer. He answered, â€œI did, in fact, itâ€™s right here on my desk.â€ He had also visited my website. Needless to say this made for a pretty easy conversion, and turned out to be a great client. Postcards reach an audience where email might be filtered out or just overlooked. If the postcard is good, it attracts attention. Make sure to have your url and telephone number on the card. But there is an even easier way to use offline marketing. The humble flyer. Instead of printing thousands of postcards, and realizing afterwards that something was wrong, or another headline or photo wouldâ€™ve worked better, flyers enable you to test creative in whatever small numbers you want. Now, instead of printing all 500 or 1,000 postcards, you could test a small sample of your list. Letâ€™s say you want to test 100. You could send one headline to 50 people (group A) and the other headline to the other 50 (group B). Or, use one image for group A and another image for goup B. You would then need to set up a different landing page for each group. So the flyer for Group A is directed to url A, and group B is directed to url B. Then you can track which creative work draws the most people. As in the postcards, make sure your telephone number is also on the flyers. And since most desktop printers are fine for flyers, the cost for a test campaign would be minimal. You could send out 100 flyers for under $50. For that amount you could get an idea of what creative works best for your postcard rollout. But flyers can be so effective that sometimes you wonâ€™t have to do a rollout. Not too long ago I did a very small test campaign, sending flyers to just 25 prospects. About 15 % called me, and proved to be highly motivated propects. I followed up and reached about another 50%. A fair number of those had seen the mailing and had gone to the website. In 4 months time, the campaign yielded an additional $70,000+ in fees, for just one service. When youâ€™re marketing a service, generally a phone call is what closes the deal. By leading off with a good mailer leading prospects to a well-done landing page, your follow up calls become so much easier and much more effective. Are you doing offline to online to offline marketing? If it suits your business you may want to give it a try. Start off by creating some flyers. Take the ones that stand out and print them out. Do bunch and see which one merits taking to the next step. If you want assistance in creating an offline to online to offline marketing check out my coaching programs. The Marketing Roadmap Mentorship program answers the needs of people looking for a complete 1 to 1 coaching program to build their business online. -Develop and refine your unique value proposition, elevator pitch, elevator sentence, and your compelling message to the target audience. …and assignments that will enable you to reach your goal faster. -You also have email access to send me questions ahead of each meeting. One of the best ways to make more money online is to raise your prices. Whether it’s for products or services. But how do you do that? The key is increasing the perceived value of the products and services. This is not a matter of making empty promises, but real things you can do without a huge effort to actually increase both the real and perceived value – you need to do both. 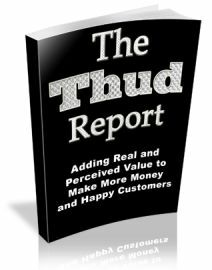 The Thud Report details 20 different ways to do that. While you may know some of these, I’m pretty sure you’ll find some new added value techniques that you could use today.